Leap Motion's innovative gesture control technology lets you command your computer by waving your hands like you just don't care, but the only way to partake in the finger-waggling action was to plop a $75 Leap Motion dongle on your desk or purchase a system—like the HP Envy 17 notebook—that integrated the technology into the computer itself. No more. Several HP all-in-ones pack gesture controls thanks to a sleek included keyboard stuffed with a Leap Motion sensor, and Leap Motion told Engadget that the keyboard will be available for standalone purchase this month. 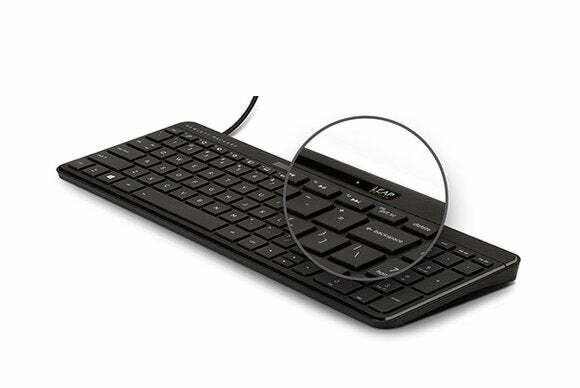 At $99, it won't cost much of a premium over the retail Leap Motion kit, and like that kit, the HP keyboard will work with any Windows 7 or Windows 8 PC after you install Leap Motion's software. Speaking of Leap Motion's software, you'll want to think about whether you're buying into the company's vision because you're interested in the technology as-is, or because you're interested in watching gesture controls evolve. Our first look at the Leap Motion controller left us feeling that the developers have a lot of work to do before the promising finger-sensing software will be ready to be a daily part of your computing life.